Central command economies have not had a great historical record: they were known for shoddy products, a bloated bureaucracy, high labor redundancy and low worker morale, frustrating shortages of goods, glaring inefficiencies in transportation and distribution, and a lack of technological innovation. Cuba’s state socialism after 1959 reflects many of these traits despite certain achievements in health care, income redistribution, employment, education and sports. In Francis Spufford’s Red Plenty (2010), real and make-believe characters show the USSR’s attempts to overtake the U.S. economically and usher in a period of “red plenty,” during the Khruschev era. Cuba too shared this notion, even if more modestly than the USSR. In Cuba’s Socialist Economy Today, Paolo Spadoni takes on the contradictions that this utopia brought forth. 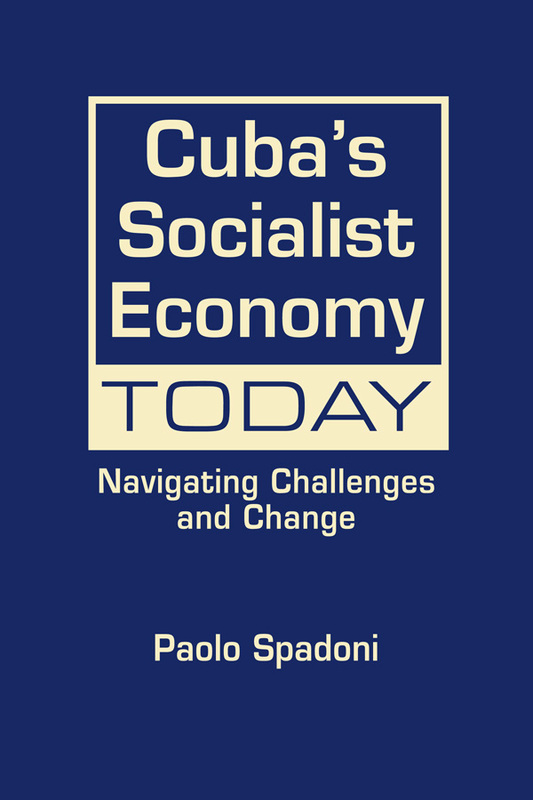 This is Spadoni’s second book on the Cuban economy; his first, Failed Sanctions, dealt with the embargo. The book is written in a clear, readable prose, and focuses on the last twenty-five years. It includes 37 tables and over 10 figures and charts that offer valuable stats, and, as much as possible avoids jargon and overtly ideological language. 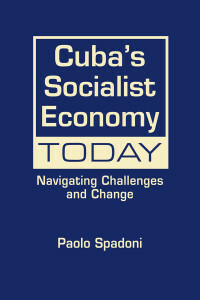 Spadoni’s book joins a growing list of research on the Cuban economy (Mesa-Lago, Pérez López, Ritter, Pérez Villanueva, Alvarez, Díaz-Brisquets, Nova González, Sánchez Egozcue, Torres Pérez, Vidal Alejandro, Triana-Cordoví, Peters, Henken). Perhaps because economic change is happening quicker than political change, scholars are finding it a more exciting field. In his introduction, Spadoni lays out some of the problems facing the Cuban economy: “sizable fiscal and merchandise trade deficits; massive foreign debt in hard currency; low productivity and efficiency; depressed real wages and pensions; significant disguised unemployment coupled with a rapidly aging population; a dual currency that distorts prices, incomes, and incentives; the precarious conditions in transportation and housing; an undercapitalized and underperforming national industry; and liquidity shortages.” (p.5) These are formidable challenges. To this one could add a seriously underperforming agricultural sector, a telecommunications sector in need of serious expansion, a crumbling infrastructure, and its over-dependence on Venezuelan aid and generosity. He returns to them in his conclusion (“The Road Ahead”), but unlike most scholars, he does not lay out different scenarios (China model, Vietnam model, social democratic model, etc.) for Cuba’s future, nor does he stake out a blindly pro-market position that assumes that the “invisible hand” will solve all of Cuba’s problems. He anticipates that in the future Cuba’s economy will have different types of property (state, mixed, cooperative, private), and have to use market mechanisms, but will retain its social commitments to free education, health care, low (or no) rent, access to sport, and generous policies in favor of the poor. For a workable future, Spadoni claims that Cuba must focus on its rich human capital, drastically improve the efficiency and performance of its state sector, and re-haul its agricultural sector so as to drastically reduce its food imports. Spadoni begins by documenting GDP growth, exports, external debt, wages and unemployment, productivity and efficiency, and industrial output. In this initial chapter we find the sobering index of disguised unemployment 20% to 35% (in 2010), which explains Raúl Castro’s eagerness to get the 1m to 1.5m people -who presumably would become cuentapropistas (self-employed)– off the state payroll. And while the number of cuentapropistas has risen sharply in the last ten years (more than doubled), it seems to be tapering off, not having bridged the gap as desired by Raúl Castro (there are 436,400 as of 2012 and the government had hoped for 600,000). In addition, cuentapropistas are having trouble acquiring goods or services needed to have their businesses thrive. (For more on cuentapropistas see Archibald Ritter & Ted Henken’s Entrepeneurial Cuba, The Changing Policy Landscape, First Forum Press, Lynne Rienner, 2015). In the next chapter Spadoni deals with the search for hard currency (oil, nickel, sugar, tobacco, remittances, tourism, professional services and the service sector). The most dramatic change in the Cuban economy since 1990 is the collapse of the sugar industry, which went from being 76% of hard currency earned from exports to 2.4% in 2012. Nickel, tobacco, and pharmaceuticals roughly remained the same (percentage wise). The largest changes were in tourism (almost quadrupling its share), remittances (from 537m in 1993 to 2.6bn in 2012), and other services, mostly payments to Cuban medical personnel abroad (4.7% to 56%). A chapter on foreign investment is followed by a thorough analysis of different economic sectors: agriculture (uneven, a bottleneck) transportation (improved, but still below 1990 levels), housing (steady, but still below 1990 figures), electric power (improvement both overall and in per capita consumption), telecommunications (slow, but steady progress), and biotechnology (a ten-fold increase in value of exports). Despite the gradual progress in telecommunications, Cuba still has a very low rate of cellular use, personal computers and internet users, not only for technical reasons (internet access is almost entirely through phone modem), but also because of the high costs of being online (simply out of reach for most Cubans). Spadoni concludes with a chapter on Raul Castro’s economic reforms and “the road ahead.” He reminds us that Cuban authorities do not use the word “reform,” but “updating” (of the socialist model)—a good thing to keep in mind, especially when some feel that the pace of change or reform is going too slow. Overall, Spadoni is approving of the changes instigated by the Cuban government, such as sale of homes and cars, more latitude to start a business, greater influence of non-state actors in agriculture, etc. But, he is equally aware that there is some opposition to these changes, that some reforms are happening erratically, and that others proceed with a great deal of caution. (For a more forgiving view of the Cuban economy see Emily Morris’s “The Cuban Surprise,” New Left Review, #88, July-August 2014, pp. 5-47). In his delightful introduction to Red Plenty, Spufford delves into Russian fairy tale traditions of abundance, of the samobranka, a magical tablecloth where one would say the magic words and the food item would appear. Khrushchev’s conjuring of Red Plenty drew on the lore of the samobranka. What is Cuba’s equivalent of the Russian samobranka? El invento, the subject of Frank Delgado’s song on Harry Potter where he credits Cuban moms with the magic of producing three meals a day for their children? Maybe, but Cuba will need more than magic or markets to make its economy move fully into the 21st century. 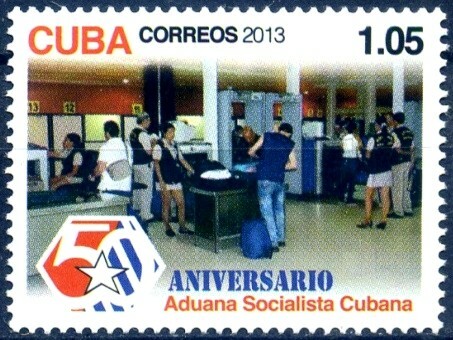 Cover image: Commemorative postal stamp for the 50th anniversary of the Cuban customs agency. Cuba 2013.